Europe is on its way to connected and automated driving, and vehicles become the new mobility and services hub. This puts the EU at a crossroads: Will the future market for connected and automated mobility in general still be able to support innovation, competition and consumer choice? 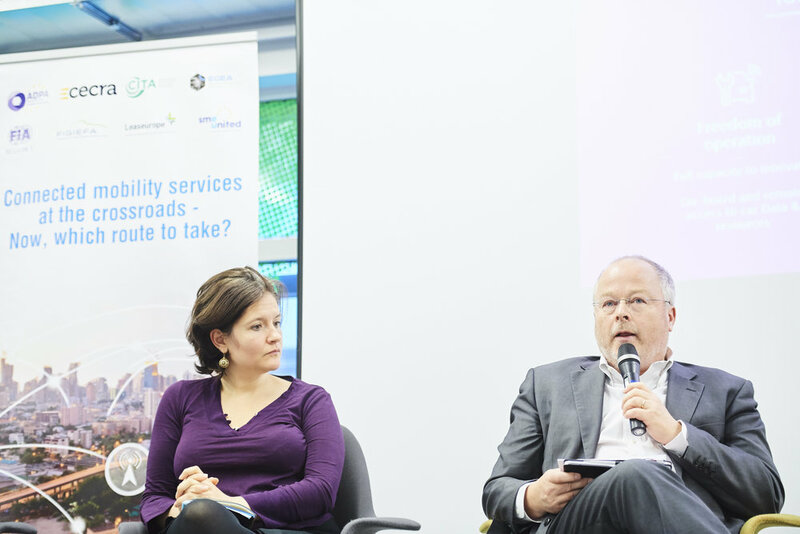 To discuss this question, eight associations representing vehicle dealers, independent aftermarket operators and the European representations of SMEs and Motorist consumers have come together during an event in Brussels on the 20th of November 2018 - united in their goal of securing consumer choice, independent entrepreneurship, competition and innovation for digital services ‘around the car’. Wim van de Camp, Member of the European Parliament and Rapporteur for the Transport Committee’s Own Initiative Report on Autonomous Driving in the EU, aimed at answering to the European Commission’s Third Mobility Package, with the view to “keep European businesses at the worldwide forefront of connected and autonomous mobility”. Eddy Hartog, Head of Unit in charge of Smart Mobility and Living at the European Commission (DG CNECT), gave an overview of the latest political and regulatory developments, especially the Third Mobility Package recently published, and the upcoming recommendation on “5G, cybersecurity and data access framework”, which will pave the way to connected and autonomous mobility and services around it, with the objective “to make sure that we have an ecosystem to keep European connected and mobility services at the top”. Against this background, a new technical field study was presented by Knobloch & Gröhn that examined a number of existing vehicle manufacturers’ own telematics systems and then compared them to the data access models being offered to third parties. The study showed, taking the examples of two of the more advanced telematics systems, that vehicle manufacturers have already a privileged position with direct access to the driver as well as to the vehicle, its data and functions. Besides that, the study revealed two myths concerning the supposed widespread development of the so-called Extended Vehicle (ExVe) model, and the ability for this system to be a satisfactory solution for fair and equal access to data. Indeed, ExVe is not widely implemented across various vehicle manufacturers, and where it is implemented it provides very poor access to in-vehicle data and functions. This is wholly insufficient for undistorted competitive services. Instead, it was found that a number of vehicle manufacturers have developed, or are developing, alternatives access methods based on in-vehicle platforms - although these remain proprietary and only open to the vehicle manufacturers’ chosen partners. However, these proprietary platforms are interoperable and are examples of how independent service providers could have safe and secure access to the vehicle, its data and its functions. The event also gave the floor to a video presentation by Bertin Martens of the European Commission’s Joint Research Centre (JRC), who had conducted a study that looked at the economic impact of five options relating to external versus internal access to car data. It found that the ExVe model results in a number of problems relating to cost of data transmission, limited data access, control by the vehicle manufacturers and most importantly, not allowing a “level playing field” and “squeezing independent services out of the market”. More generally, all models where vehicle manufacturers have ultimate control over data, data flows and resources leads to major deficiencies. The JRC looked at which scenario produces more innovation, consumer welfare and ways to increase competition to avoid vehicle manufacturers’ takeover of downstream services markets. It concluded however, as a first preliminary statement, that available policy tools may have limited impact, some of which would need to be adapted to safeguard a level-playing field in the automotive digital aftermarket, for example the Type-Approval Regulation with a platform competition aspect. Participants to the panel discussion unanimously called upon the European institutions to act now and to regulate the Open Telematics Platform (OTP) which is the only access model that enables all independent operators within the whole automotive supply chain to compete on an equal footing with vehicle manufacturers by independently accessing the vehicle, its data and functions. A standardised, interoperable and secure in-vehicle platform, including access to the driver to offer and authorise new remote services, would in turn support the standardised requirements related to autonomous vehicles. No monitoring by the vehicle manufacturer. ADPA represents the European independent automotive data publishers. CECRA represents the European motor trade and repair businesses. CITA represents the organisations inspecting or supervising inspection of in-service motor vehicles and their trailers. EGEA represents the European garage and test equipment manufacturers and importers. FIA Region I represents the European motoring and touring clubs. FIGIEFA represents the European independent automotive aftermarket distributors. LEASEUROPE represents both the European leasing and automotive rental industries. SMEUnited represents European crafts and SMEs.